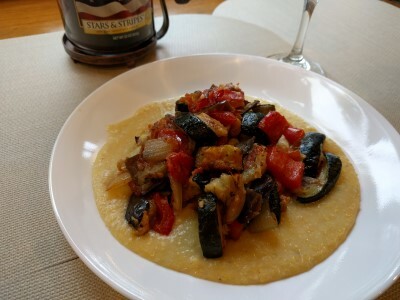 A couple weekends ago, we made Ina Garten's Roasted Ratatouille with Creamy Parmesan Polenta for dinner. It's from her cookbook Cooking For Jeffrey. It's super easy and there are lots of veggies: zucchini, red & yellow pepper, eggplant, onion, and tomatoes. Just chop all the vegetables (except the cherry tomatoes) about the same size, season with salt and pepper, toss with olive oil, spread out on a large baking sheet, and roast at 450 until tender and browned. Lower the oven to 425 and add the tomatoes. Cook another 15 minutes. 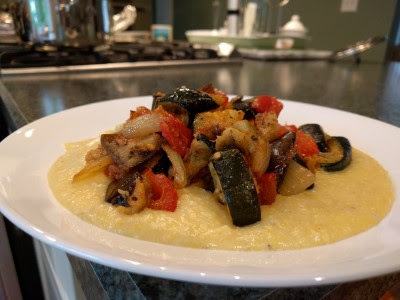 Serve over polenta. This is the best polenta we've ever made. Maybe because we bought a pricier polenta: Bob's Red Mill medium grind stone-ground cornmeal. It's what Ina says she uses. Maybe because of the cheese, creme fraiche, and butter (we used sour cream instead of creme fraiche). It's really tasty. We kept scraping it up off our plates. *Apologies for having only these 2 cell phone photos. Something was off with the good camera and all the photos turned out blurry. Creamy Parmesan Polenta recipe here.